Aquaculture, the farming of aquatic species, is gradually becoming an important aspect of solving the challenge of global food security. The supply of seafood from fisheries is declining; fish stocks can only be increased if we reduce our fishing pressures, yet governments continue to subsidize the fishing industry for us to fish more. Hence, the open window we have is aquaculture. My argument is that we need to change from hunting in the ocean to farming the oceans just the way we changed hunting on land to producing animal protein by farming. Can aquaculture be our best option to increase the seafood supply for the world’s ever increasing population? With an average growth rate of about 8.8%, aquaculture has proven to be the fastest growing agro-food sector in the world. However, this industry has a bad image, no thanks to the high dependence on the natural ecosystems for inputs, other impacts on the environment, and the definition of sustainability. When the question of whether aquaculture has been practised sustainably is asked, my best answer is “yes” but really, I don’t think people know what exactly sustainability is when it comes to aquaculture. I believe the issue is that many still can’t separate fisheries from aquaculture. Farming aquatic organisms is quite different from hunting them in the wild. First of all, aquaculture is the business of growing fish not catching them. You take good care of their needs with the hope that you gain something out of them. However, business is still business, you don’t just start a commercial farm with the idea of feeding the world but it’s a business just like every other business. So, who is practising sustainable aquaculture as a business? It could be hard to find definite answers to these questions even with different certification bodies employing methodology to rank aquaculture farms for best practices. Balancing sustainability on its three pillars — economic, environmental and social — in an industry like aquaculture could be so challenging, especially the environmental and economical parts, also known as viability. All businesses respond to consumer needs with some social responsibility, which in some cases serves as marketing for a return of benefits and the aquaculture industry is the same. Can farming fish through aquaculture help with global food security? Image: "Aquaculture" by Michael Chu, CC BY-NC-ND 2.0. Sustainability in aquaculture can be summarised into five major points and undoubtedly these points should be the key to the certification of farms. Firstly, sustainable aquaculture should be using less wild caught fish (all reduced products; fish meal and fish oil) than it produces. That is a Fish In Fish Out ration (FIFO) of less than 1. More than 70% of marine fish and crustaceans use a value great than 1 (such as salmon, 2.2; trout, 1.9; shrimp, 1.2) and about 70% of freshwater, cultured species use less than 1 (tilapia, 0.3; catfish, 0.4; milkfish, 0.1). Aquaculture production data presently shows the steady increase in the culture of higher trophic level aquatic organisms — a phenomenon Daniel Pauly called farming up the food web. This literally translates to an increase in dependence on natural resources and hence the question of sustainability comes in. These farmed high trophic fish, like salmon, are in high demand, particularly in the developed world. Until we find an alternative to reduce the pressure on fisheries for fishmeal and fish oil, higher trophic fish will still have a sustainability question. Secondly, sustainable aquaculture facilities should not pose a substantial risk to the wild fish stocks through escape of culture species or transmission of disease or parasites. However, these escapes and transmissions are common with open aquaculture systems that have direct contact with the environment. Some records of escapes in Canada include: in 2012, about 2500 Chinook salmon escapes, averaging 2.1 kg, were reported; 300 Coho salmon in 2013; 13,000 rainbow trout weighing about 400g in 2014. There are also numerous reported cases of disease outbreaks in open cage systems around the world, hence, the question of sustainability. The third issue of sustainability is the methods to which such facilities treat and release the discharge of organic waste so that the resulting discharge does not affect the surrounding ecosystem. What is the best method to be employed by open aquaculture systems for example? I don’t see any, as the waste goes directly into the water column but most of these systems have certification from one or two certification organisations and there are other systems that are effective in waste management such as re-circulatory system, Integrated Multi-Trophic Aquaculture (IMTA) or aquaponics without certification. Fourthly, just like every other business, sustainable aquaculture must employ best practices in terms of social impact on its workers and the host communities. There have been different reported cases of slave labour in the Asian aquaculture industry. 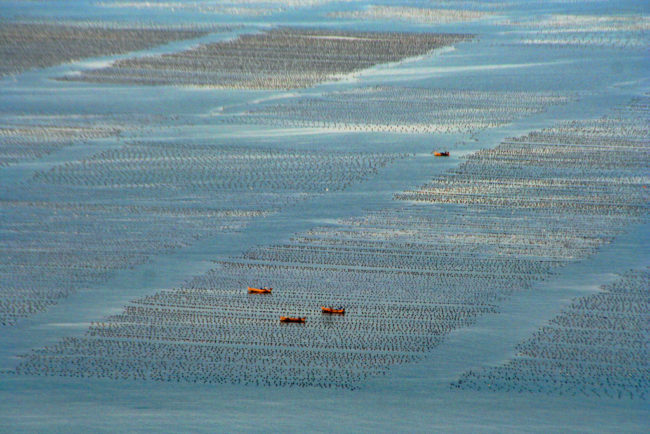 In fact, an online news magazinereported that Vietnamese shrimp aquaculture poses a greater threat to China due to its lower labour costs than China, where we all believe labour is cheap within the industry. This clearly shows how some companies milk their workers to produce cheap, farmed products for the growing population. How sustainable can this be? Lastly, sustainable aquaculture must also be economically sustainable. All business exists to make a profit, no one starts a commercial firm without expecting a profit. But the dilemma for all farm businesses is that it is subjected to maximising profit and minimising cost with an increase in output especially in a competitive industry. Hence, intensification, specifically of mono-species has been our best idea for solving this challenge and meeting the demands of the growing population. This has been the major reason why other systems which involve less intensive production are less attractive economically. A number of such systems are found in developing countries. Farmers can incorporate plants or animals with their fishponds, which is how integrated multi-trophic aquaculture (IMTA) or aquaponics works. Such systems use less inputs and produce without chemicals or antibiotics, have low-waste discharge and have no harmful impacts on the environment. But of course, they also have less output and have to fight a great battle with economic sustainability. This is just because small farms have to compete with the large ones whose production is much higher at a much lower cost done in an unsustainable way, but with a certification logo. 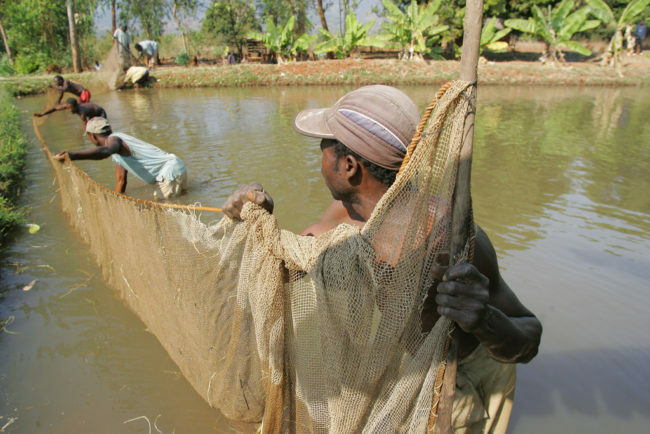 Can small-scale aquaculture products be marketed in Africa? Image: "Farming fish. Photo by Stevie Mann, 2007" by WorldFish, CC BY-NC-ND 2.0. Is sustainable aquaculture viable in Africa? 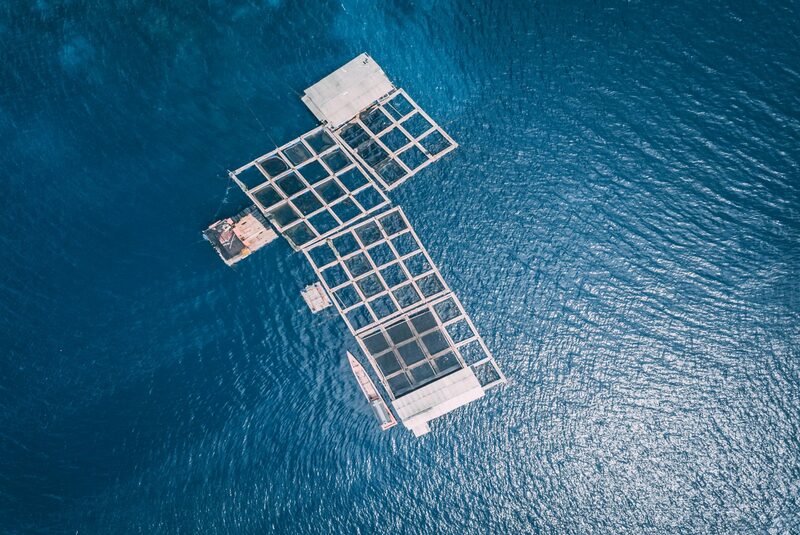 This is a complex challenge but recently the idea of seafood production from small-scale aquaculture units that are environmental friendly has been on the surface. This is to encourage small unit aquaculture by investing in their sustainable practices that will generate investment returns but also create a positive environmental impact. The funds are provided by investors who have sustainability in mind hence, their expectations regarding returns are low, that is environmental sustainability first before economic sustainability. But the major problem in what I will refer to as small sustainable aquaculture is hard to market because the cost to produce fish is still not competitive unless it scales up and reduces the cost and the price follows suit. In 2014, a professor from Senegal presented an outlook on fisheries and aquaculture of the country to a large audience in Germany. He described the aquaculture sector as still developing and very sustainable but said that marketing was the major issue. In Sub-Saharan Africa for example, aquaculture produced is for the “big man” (the rich) simply because farmed fish is more expensive in Africa. For example, the cost of tilapia in Ghana is about $3-5 USD per kg while it’s about $2.20 in the USA. To reduce the cost, perhaps to $2 USD, they need to scale up from small-scale farms while also finding a way to access larger markets, like the US, because there are not enough “big man” to buy 2USD fish in Ghana. We must not forget that 24% of Ghanaians live below the poverty line. Likewise, in the Nigerian aquaculture industry, which hasn’t been able to export or diversify from producing African catfish, even tilapia is not doing well despite the private investment. The discharge of organic waste into ecosystems is one aspect of aquaculture that needs to be examined. 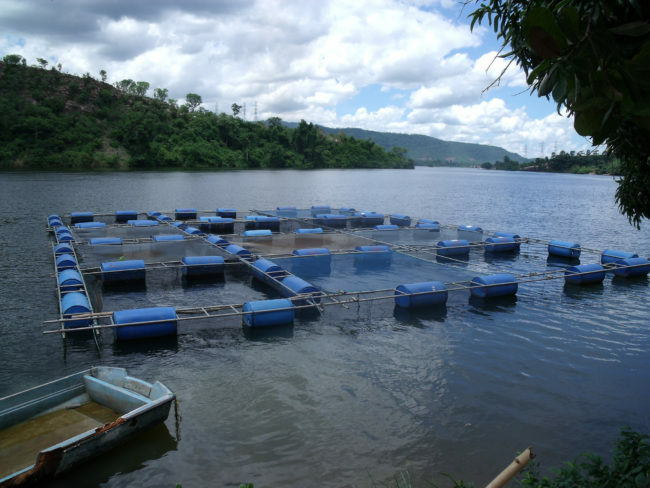 Image: "Cage aquaculture in Ghana. Photo by Curtis Lind, 2009" by WorldFish, CC BY-NC-ND 2.0. Finally regarding investment for sustainable aquaculture, investment of this kind (funds towards environmental sustainability only) in small units aquaculture without proper marketing strategies, especially in Sub-Saharan Africa, will end up developing two new challenges: increased subsidies in the industry, with an uncertain future, and, more importantly, intensification. To date, the aquaculture industry in Sub-Saharan Africa hasn’t experienced major disease outbreaks or shown any substantial risk to wild stocks or the aquatic environment at large yet no aquaculture company in Africa has received accreditation or certificate of best practices. Probably none of these companies apply for such certification because they can’t afford the process or simply African aquaculture hasn’t been intensified enough to receive such logos. The truth of the matter is that an increase in investment without a proper market will open aquaculture in Africa to unsustainable issues as we have in Asia and South America. And let us remember, food security has always been the issue in Sub-Saharan Africa, the world can’t afford to add food safety. My study focuses on aquaculture under climate change and it addresses some of the uncertainties that are considered in the discussion above. All points I have raised in this article are “current issues” and don’t account for changes in the environment. Certainly, climate change will affect aquaculture, not just the environment but also the socio-economical input of fish production and the balance between fisheries and aquaculture. 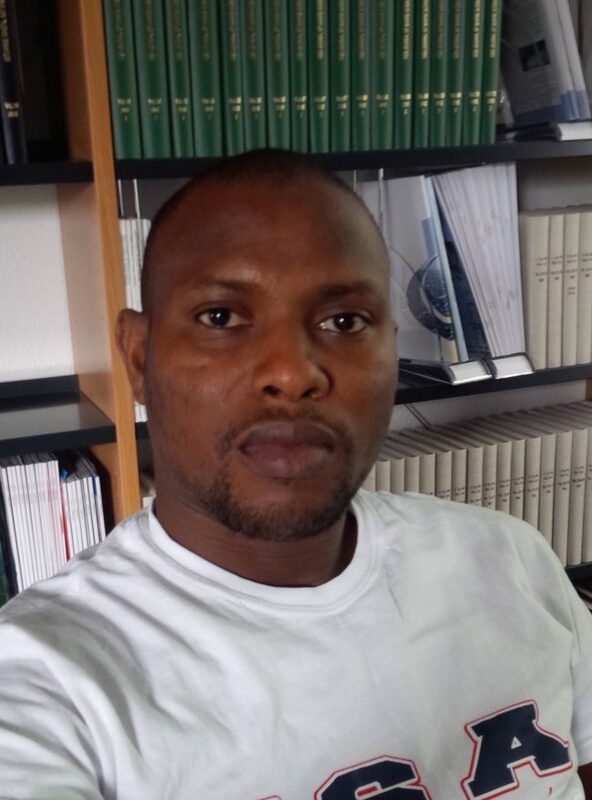 Muhammed Oyinlola is presently working on his Ph.D at the University of British Columbia with the Changing Ocean Research Unit and the Nereus Program of the Institute for the Oceans and Fisheries. His studies focus on the implications of climate change and ocean acidification on global seafood production from aquaculture.